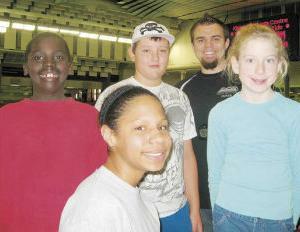 Hillside Lanes League Bowling results for the week of Nov. 22-25. Ladies: High single - Marina Adrian 196, Edith Lehmann 187; High triple - Edith Lehmann 485, Dorothy Haller 478. Men: High single - Lawrence Kahler 252, Jim Sailer 219; High triple - Lawrence Kahler 664, Jim Sailer 615. Four swimmers from the Neons Swim Club, coached by Nate Thiessen, were among the 450 attending this year's Poppy Invitational at Kinsman Sports Centre in Edmonton. It was a beautiful venue, and our young swimmers were fast! We let our presence be known by winning ribbons, medals and record times. 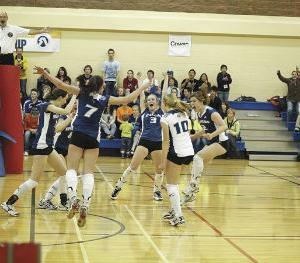 Three Hills School was host to the ASAA 2A Girls Provincial Volleyball, November 25-27. Thursday morning, an energy filled gymnasium welcomed the 12 teams to Three Hills for the beginning of a competitive weekend. After the six scheduled games for the day, the girls put on their best dresses, and made their way to the Bethel Evangelical Church for a banquet. Day two of competition was a full day of opportunity for the athletes to show their team work and dedication had paid off.